The latest peculiar fax variant is the ¥39,000 ($315) Speax SP-NA540W from NEC, which has co-opted the communication methods of its evolutionary rivals by learning to handle email. According to the NEC press release, the main purpose of the emailing fax is to keep worker drones chained to their jobs even longer by having the machine email PDFs of incoming faxes to their phones or home PCs through a LAN cable. 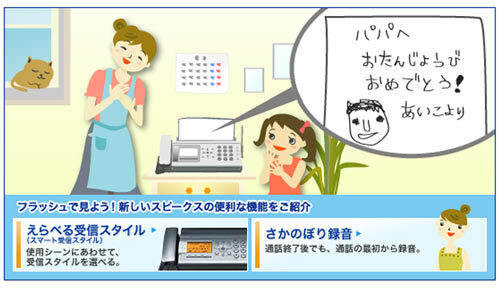 More cuddly illustrations show small children faxing their drawings from home to Dad’s phone, thus cheering him up as he slaves away to underpin Japan’s crumbling economy. While a computer can handle a full-size fax, the NA540 automatically resizes those sent to phone email addresses to a more manageable 640 x 480 pixels. It manages this by being aware of which addresses in its memory belong to mobile phones, plus it can be told if there’s a preference for JPEGs or TIFFs instead. On top of all that very un-faxy malarkey, there’s a button to automatically tell nuisance callers where to hang up, 45 minutes’ worth of memory for recording calls and two wireless handsets. Available from the end of August and only in Japan.